After leaving school in 1992 I went to college to study motor vehicle repair and servicing of road vehicles, after the first year I started an apprenticeship at a Rover garage in Diss. 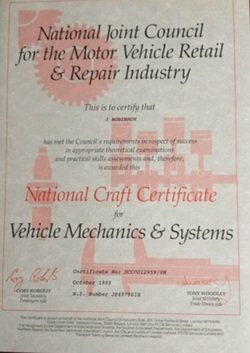 I continued at college in between working for another 2 years and gaining a National Craft Certificate for motor vehicle repair. My aim is to keep up with the fast moving systems on modern vehicles, by this keeping up with tools and technical training to allow me to keep your vehicle in the most reliable and efficient condition. I believe that keeping up with the latest training is key to repairing modern motor vehicles.